I think this film was subtitled by someone with narcolepsy who kept suddenly falling asleep and upon awakening would simply continue working without going back to see what he had missed. Only about a third to half of the dialogue is subtitled, so I am not sure if my finding the plot difficult to follow was my fault, the narcoleptic subtitler’s fault, or the filmmaker’s fault. In any case, despite this handicap I found this highly entertaining. 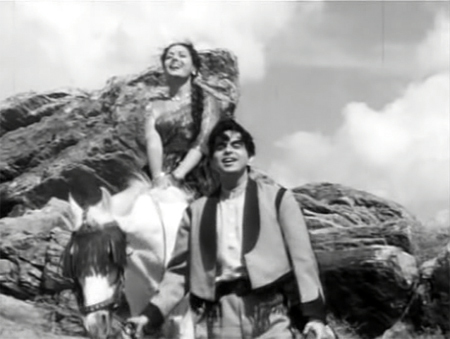 First of all, the Shankar Jaikishan songs are beautiful (although much of the background music is from Prokofiev’s Peter and the Wolf—which is not a bad thing); secondly, it’s one of Nutan’s first films and she is lovely; and her hero is Nasir Khan (Dilip Kumar’s brother) in the first leading role I have seen him in. It also succeeds pretty well as an atmospheric mystery-suspense-thriller (it was given an “A” certificate by the censors). 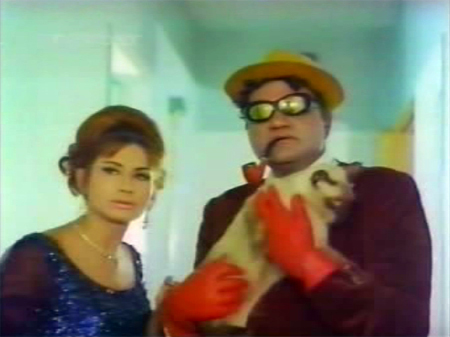 Manmohan Desai! How I adore you. And this sort-of-medieval swashbuckler with snake gods, sword-fights, dacoit Ranjeet, Bela Bose as a greedy courtesan, and Jeetendra and Shatrughan Sinha as brothers on opposite sides of that pesky line between good and evil has not changed my mind one little bit. The setting is gorgeous too, as the movie was shot on location at the spectactular Laxmi Vilas Palace belonging to the Maharajah of Baroda. It’s much less loony than the film it vaguely reminded me of (Dharam-Veer); I guess, my dear Manmohan, you hadn’t quite reached your full masala stride yet. Still, it’s an entertainer in your trademark style, with lots of action and well-drawn characters. I really need to see more Tanuja. I like her in everything I see her in (Jewel Thief, Do Chor, Haathi Mere Saathi, for example) even if I haven’t particularly liked the movie much (Mere Jeevan Saathi, for example). 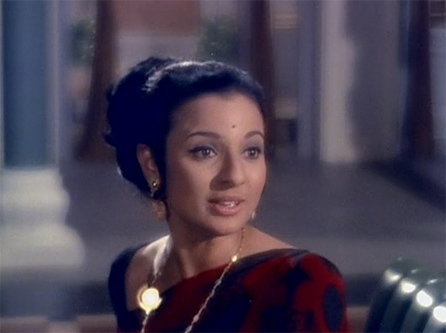 It holds true for this film too: Tanuja is lovely and fun to watch. 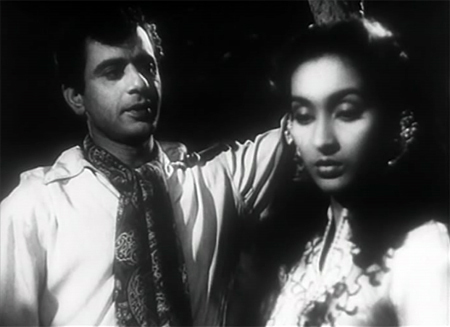 Despite a lively soundtrack from RD Burman and Amitabh’s lambi presence, the film really only lit up when she was onscreen. The story is ho-hum, and there’s all the usual overacting and melodrama, but she makes it watchable somehow.